I have worn tank tops to the office too, with a blazer on top. Very comfortable when it is hot outside, that way I can get rid of the blazer as long as I am alone in the office and throw it on if I need to see someone. We don’t have air con and it can get hot in summer. I can't imagine not having aircon in summer, but our summers are very different! I am a fan of printed tanks since it does the work for you. It's great to wear on it's own or under a cardigan or jacket for cooler weather. I do love your hair too Mica! The curls are gorgeous. I curled my hair over the weekend and I just about cried at how it wouldn't cooperate! I need to check out the curler you used perhaps it's time to try a different curler! I hope you had a great weekend and happy Monday! I've never had luck with curlers before this one, it works so well! I am not surprised your hair got a lot of love on Instagram! I feel like you've been hiding it from us for awhile! It's gorgeous! But your printed tank outfits are great too! It's so nice that they can do double duty for work and family life! haha thank you Gina! I don't curl it often as I am growing it to donate it so I need to avoid over styling and breaking the hair! Such cute outfits! Love the handbag! PS This RM bag is one of my fave of yours. Such a classic piece and goes with anything. haha thank you! It is a great go-with-everything bag! Ahhhh I love that tank on you!!! The whole outfit is just perfect:) Happy Monday friend! Your hair looks so pretty! Loving the fun outfits as well! Have a fantastic Monday! I love your work wear - you look polished, but I know that knit skirt must be so comfortable to wear all day! 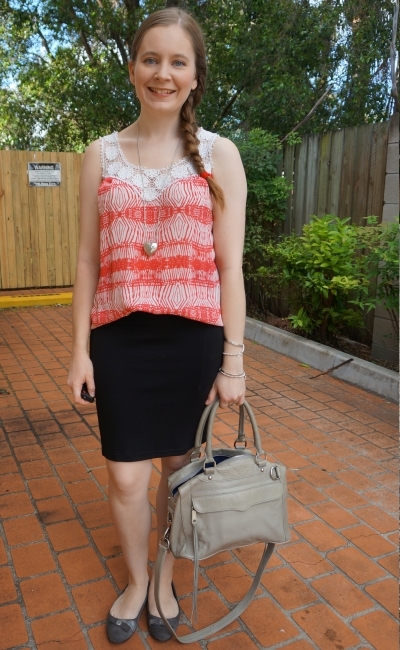 Printed tanks are such a versatile wardrobe staple. I love how they can easily be worn for work under a blazer or on their own in more casual situations. And agreed, printed tops may not be "basics" but they're definitely closet staples because of their ease of going from home to work! haha thanks! :) I would love to curl it more, but I'm trying to donate it so also trying to avoid over styling it. I think I'm the same way Mica. I have the most of print tops in my closet. You'd never accuse me of only liking solids...that's for sure!! But they add interest to everything....skirts, jeans, maxis...you name it!! They are great for adding extra interest like that! I can see why you got so much hair love! It's the first thing I noticed when the blog loaded. Gorgeous! I try to make my curls last a few days too. It makes things to much easier! 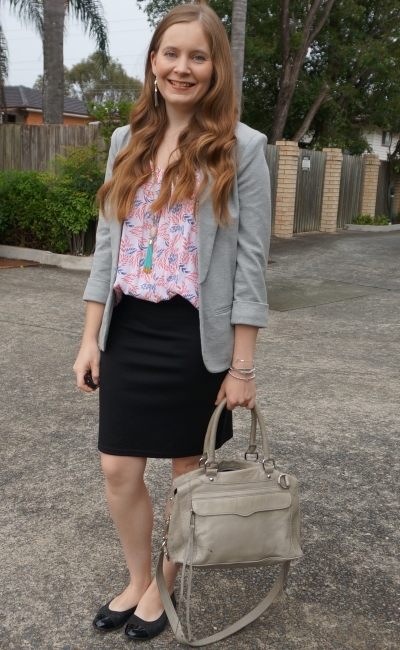 The outfit is a chic option for a work look too. Hope you are having a great start to your week! Thanks Laura! It takes so long to curl my hair I like it to last a few more days, haha! Your hair looks sooo lovely with a wave in your hair babe! I've always said how much love I have for pencil skirts, and you style them really well Mica. Have a fabulous week! You've now made me a huge fan of printed tanks! I love both ways you styled them, especially the first look with the blazer. It's always nice when clothing pieces can work for both work and daily life. And I can see why your hair got a lot of love; it looks beautiful! Thanks Kara! 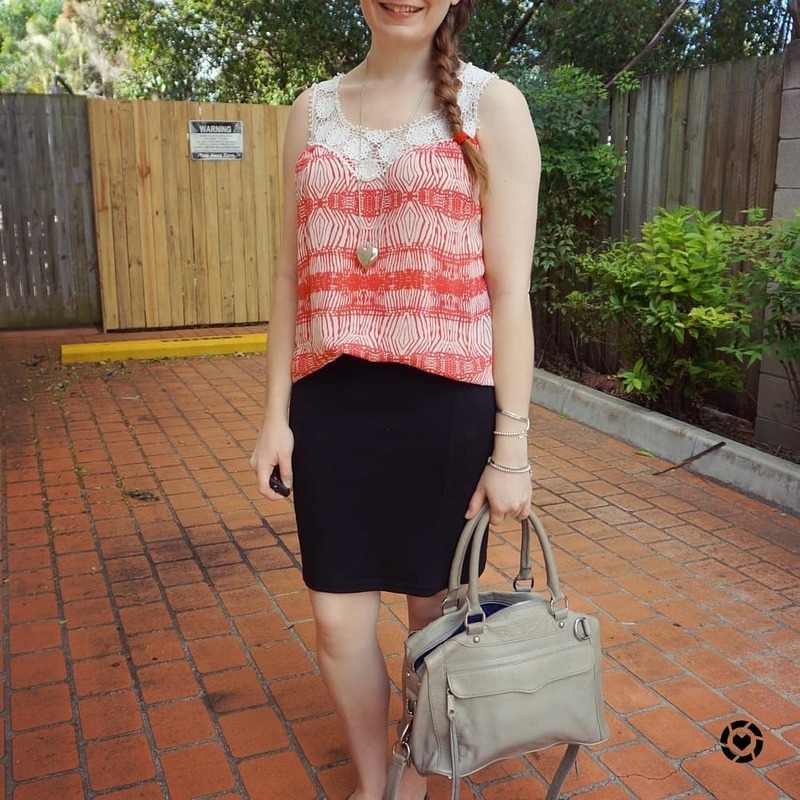 Yes, it's great when pieces do double duty and can be worn to different occasions! Such cute outfits, Mica! While I don't wear any casual tanks to the office, I do love woven fabric tanks as layering pieces, and have them in tons of colours, including a few prints. While I appreciate the neutral bag, I think I would personally do a turquoise bag with the top outfit, and a coral red bag with the bottom one. But that's just me! I totally agree with you on printed tank tops. That is a pretty purse! Love the prints especially the look with blazer is so beautiful on you! I'm back! I explain everything on the blog. You are a very classic woman Mica, always your look is chosen to the detail and I am amazed, I was absent from the blog for 2 months and, and where is the winter there in Australia? I loved your second look, you certainly made a beautiful pregnant woman with this tank top !!! I hope that you have a great Christmas and a Happy New Year! That was the first thing I thought. That hair! Amazing! Didn't know I wasn't following you on IG! I am a huge fan of printed tanks for precisely the reason you mention - they function great with jeans and casual wear and then clean up perfectly for work with the addition on a blazer. I love having versatile things like that in my closet! This style of top is so good for the summer either for work or casual. You look lovely! That's the first thing I saw: the beautiful long hair Mica ! when did it get so long ? 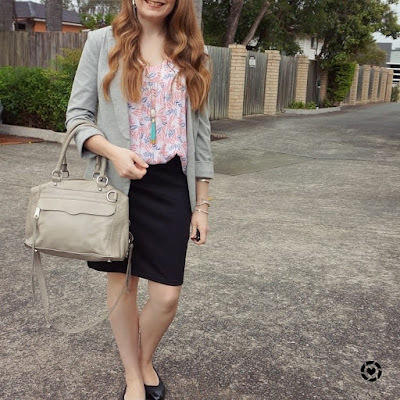 Its looks amazing - I really like this grey blazer office look, you look so nice. Thank you Lorena! it's got a little further to grow before I can donate it! Such a staple bag- and your HAIR in the first pic! Gorgeous! I love how versatile pretty printed tops can be, they work for all occasions. I love both of the tanks you've styled here. And your hair DOES look gorgeous, I can see why it was getting all the love!! So pretty! I really like first business outfit. It is so elegant and beautiful! Also you hair is amazing! I really love it. Your hair looks amazing! It’s grown so much and looks so healthy! I love printed tops too. They’re so easy to work with and are versatile. Thanks for shading and I hope you’re having a great week so far! You look really nice! I didn't realize how long your hair has gotten, it's so beautiful! Both looks are great. I really love the blazer of the first look! Your hair looks gorgeous and I can see why you got so much Insta love! Both of these looks are so pretty! I need to embrace more colours and prints next year! You look lovely in both outfits. Merry Christmas and happy new year to you and family, Mica! I love both outfits! You look so chic in a pencil skirt!! Tanks really are such versatile pieces of clothing and work perfectly with work attire. The way you styled the two tanks in these looks is lovely. I love that the prints add such a fun element to a more neutral look. Fab look Mica, you look amazing darling and loving your hair!! Have a wonderful Christmas and New year!!! Lovely looks dear, especially the first one. Such a chic contrast from the blazer and floral top underneath. Love the printed tank. Not very often I get to see, Great style! Thanks Shanaz! I really like it curled, but don't do it much because I'm trying to grow it to donate it! I really like the tank- it's so delicate and looks so floaty and perfect for a hot Summer's day!! Thanks all for your lovely comments - and compliments on my hair!